Description: During the mid-eighties, Fisher-Price introduced the #634 Motorcycle set in Europe. 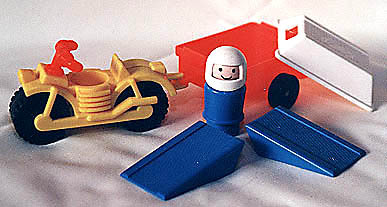 The set includes a motorcycle, a trailor with a removable lid that doubles as a ramp center piece, 2 blue ramps, and a Little People motorcycle driver. In 1985, Fisher-Price introduced #2351 Motorcycle set to the USA, which included 3 pieces: a motorcycle, driver, and a pylon (same motorcycle and driver used in the #634). Sadly, the trailor, lid, and ramps that were available in Europe were never sold in the USA. FPT4579 - Yellow motorcycle with red handle bars that rolls on 2 black deep tread tires. Has a peg on the back to attach a motorcycle trailer. 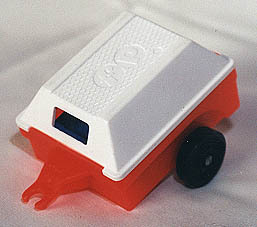 DIVISION OF THE QUAKER OATS CO.
FPT4581 - White motorcycle trailor roof / lid that doubles as a center ramp center piece. Has "FP" within circles on the top. 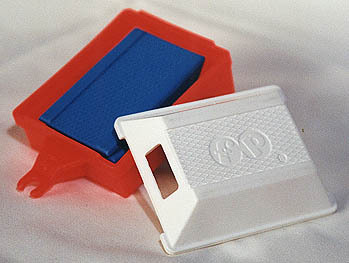 2 each - FPT4582 - Small blue plastic wedge shaped ramp that has raised outer edges and a diamond cross-hatch pattern in the center. 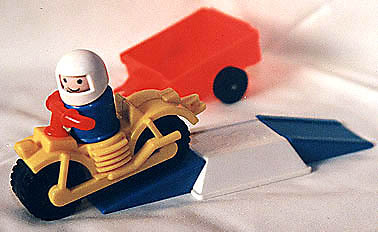 AVPP - Tall blue-bodied Original Little People motorcycle driver wearing a white motorcycle helmet. This set was sold only in Europe. 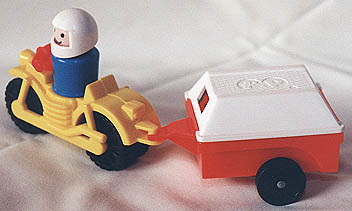 Although we do not know the exact dates that this set was available, we did see it pictured in the 1986 Dutch Fisher-Price Dealer Catalogue.